On the night of April 21, 2012, that year's Lyrid meteor shower peaked in the skies over Earth. While NASA All-sky cameras were looking up at the night skies, astronaut Don Pettit, then aboard the International Space Station, trained his video camera on Earth below. This image was taken on April 22, 2012. The Lyrid meteor shower of April put on an eye-catching sky show as seen from Earth, but the view from space was truly spectacular. Don Pettit, a NASA astronaut aboard the International Space Station, pointed his camera downward during the peak of the Lyrid meteor shower, in the early morning hours of April 22. From about 240 miles (386 kilometers) up, he captured stunning footage of meteors streaking through our planet's dark skies. One six-second exposure, for example, shows a Lyrid burning up in the atmosphere just west of Florida, whose many lights shine bright in the predawn hours. The Florida Keys are visible, as are the lights of the U.S. Gulf Coast to the west and Cuba to the south. 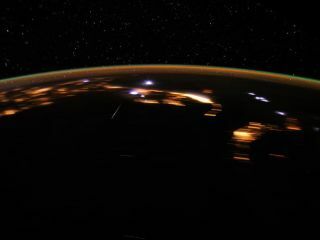 Brilliant purplish-white bubbles of light to the right of the meteor are flashes of lightning, NASA officials said in a May 18 statement unveiling the images and video. A second version of the Lyrid meteor image identifies the constellations above Earth in Pettit's camera view. More meteors streak through the air — and much more lightning crackles — in a short video of the Lyrid meteor shower from space created by stringing together 316 photos Pettit took on April 22. Researchers at NASA's Marshall Space Flight Center in Huntsville, Ala., hope to combine information from the images with their ground observations and possible Lyrid views from a balloon camera launched on the night of April 21. The goal is to produce simultaneous space and ground imagery for Lyrid meteors, which can hopefully be used to test ideas for processing data gathered by future space-based meteor observatories, NASA officials said. The Lyrid meteor shower has been observed by humans for more than 2,600 years. It occurs each year in mid-April when the Earth passes through a stream of dust left behind by the comet Thatcher (also known as C/1861 G1). This comet dust can reach speeds of up to 110,000 mph (177,027 kph) as it slams into Earth's atmosphere, causing it to ignite as dazzling meteors. Pettit has lived on the space station since late December and is a flight engineer for the orbiting lab's current Expedition 31. In addition to his regular duties as a space station crewmember, Pettit has spent time performing extra experiments to boost interested in science and engineering. Pettit is scheduled to return to Earth with two fellow crewmembers — cosmonaut Oleg Kononenko and Dutch spaceflyer Andre Kuipers — on July 1.